Black Hole Aliens Invade Marmit and Old School Fan Films! – SKREEONK! Black Hole Aliens Invade Marmit and Old School Fan Films! Jolly Sunday, all! Jon @ UnCanny here. I’m positive that this photo has made its rounds since Marmit released it back in October of 2012 – but as January seems to rapidly disappear before my very eyes I cant help but get really excited for this guy! I’ve had my pre-order in place for this excellent new Black Hole Alien Marmit since this photo’s release. The figure is slated for a Jan 2013 unveiling, but Marmit tends to be a bit late with their actual distribution. Hopefully we will all begin to see these bad boys ship by at least early February. Not many vinyls have been made of the Black Hole Aliens – very few, in fact. The only mainstream release that immediately comes to mind is the Marmit Parababy figure coupled with their ‘Fake Godzilla’ sculpt – both of which are great figures (and can be seen at Club Tokyo here). This lovely fan film is the fruits of my labor from several years ago. Its a highly enjoyable 15 minute romp entitled Mothra X Mechagodzilla: Revenge of the Black Hole Aliens. It became very popular on Youtube due to the non-stop motion Kaiju action, miniature sets, and – mainly – the titular character of the piece – Commander Zog, the Black Hole Alien. You’ll have to watch the film above, if you havent already. Its completely worth it. I had an absolute blast doing the puppetry and voice work for this little film! The project was posted in two parts, so make sure to check out PART TWO if the first video doesnt lead you directly to it. 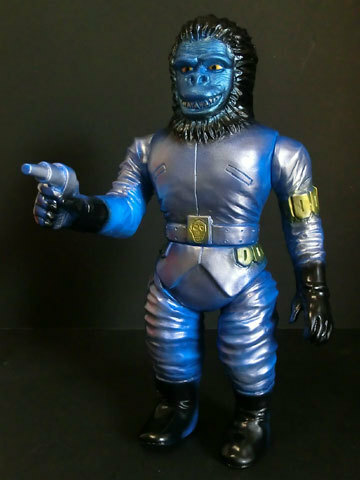 As always, I’ll be sure to update you when I hear more about the release of the Marmit Ape! Take care everyone, and until next time! Posted on January 20, 2013 4 By Jon D. B.	Collector's Update! Posted in Collector's Update!, Fan Fare! I love all the aliens of the Godzilla and Gamera films of the ’60s and ’70s and wish the toy companies would manufacture more of them in a nine inch size. Miss Namikawa is nice, but there are so many other cool seijin out there as well. Couldnt agree more, Max! I’m a huge fan of the humanoid character vinyls, and am trying to amass a collection of them. I have the three M1 Mysterians, as well as Miss Namikawa (as you mentioned), and when this bad boy is released I’ll be placing all five of them front and center together. I need to track down some more Ultraman standard vinyls to display with them. Where can I order the Marmit Black Hole Aliens? Pre orders sold out through Marmit, but new waves and variations are set to release throughout the year. Keep an eye out for dealers selling stock, Amiami and hobbylinkjapan would be two good places to check! Next Post Happy New Year, Kaiju Fans! Who was the Fandom’s Favorite Godzilla!? Previous Post Frank Darabont Shall Make the World Fear GODZILLA Once More!